Birdline Canada wishes to thank the Calgary SPCA for allowing us to be present during the monthly kids group called KFAC – Kids For Animal Care. This group runs yearly from Sept until June and focuses on the care and lifestyles of all animal species. This months group was taught the basics of bird care for most parrot species – how much a bird would cost – and the requirements of both nutrition and cage sizes – they were able to hear what a loud and lonely cockatoo sounds like as well as see what a plucking bird looks like – both on screen and with the presence of one of our pluckers. While we were unable to do a long presentation regarding the plight of captive parrots – we were able to share some of the birds in our care and the special needs they require. It was a great oppurtunity for Birdline to share what we do and why we do it and we look forward to working with the SPCA in the future. Birdline will be back in Sept to do a longer presentation on Parrot Rescue – Education and everything involved with the care and rescue of neglected and abused birds. A huge thank you to Jamie for inviting us to this group and we look forward to working alongside you in the future. 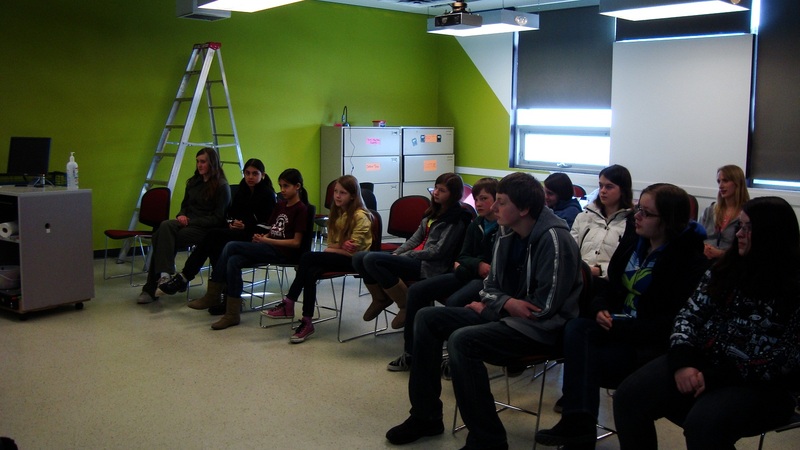 Here are a few photos from our day at the SPCA. 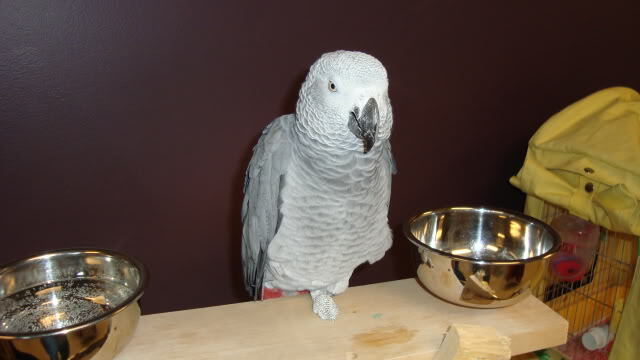 Kaylan – the African Grey with no toes – a result of a neglectful breeder. A tribute to Nina – while Winston our first rescue was the catalyst in having us think about rescue – Nina was the spark that got everything rolling – her life and death is the reason Birdline Canada exists today. A guest visiting with Elvis after her adventure.. 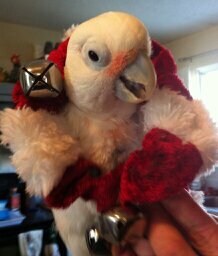 This is Captain who belongs to Jamie – a very well behaved Quaker Parrot. The kids in the group offered to assist us with the building of some toys – we brought the materials and they helped put things together – these toys will be sold at the upcoming Pet Expo to raise funds for the rescue. Thank you very much to all who participated!!!! The group of birds waiting patiently to come out of their cages – Coco the Eclectus was incredibly well behaved considering she is rather hormonal right now – later in the day she did find a paper bag and spent about an hour hiding out in it..Elvis the tiel was great after her adventure 🙂 Kaylan did the BEST of all – he has never been in this setting before and we were a bit concerned how he would react to the large group and different things going on – the photo of him above shows how he remained for the duration – at one point – he tucked his head around back under his wing and had a nap. Seymore the Quaker did fantastic and stayed with me or Sam the entire time. Elvis decided to show everyone that she could indeed fly, and very well. The previous day she did not get much air space at home – maybe 6 ft before fluttering down – well – she went up about 18 – 20 ft and remained up there until we got a ladder and coaxed her down – the students were all than shown the proper way to do a wing clip – Elvis made an “excellent” student. Seymore and Captain got along very well for the short time they sat there – no aggression, no biting, no lunging – both were on their best behavior. Seymore was showing me how well he can “grab” eyelashes again – he hasn’t been able to do that since the loss of his beak last June – he almost got it out!